We are at Hoods Crossroads Shopping Ctr. at the Round-about on Matthews-Mint Hill Rd. Exit 49 off I-485 turn towards Matthews. 2.4 miles from Independence Blvd. Technology is a huge part of our everyday lives. When something goes wrong, it’s important to get back up and running fast because making a trip to a repair shop just doesn't always fit into your schedule. 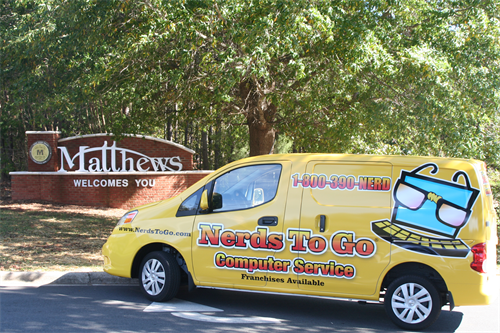 Our IT technicians, "Nerds", provide on-the-go IT Services and Computer and Mobile Device Repair where it's most convenient for you...at your Home or Business! All of our Nerds have a minimum of five years industry experience and a variety of certifications, including CompTIA A+, CompTIA Network Plus, CompTIA Security Plus, various Microsoft certifications, manufacturer certifications, along with NTG Technical Specialist Certification from NerdU. We'll be opening another franchise location in the Matthews-Mint Hill area in early January! Let us be IT for you! We're thrilled to be opening soon in Matthews!